Portable Ejector Seats – Everyone’s Friend! There have been many times when I’ve wished I could eject myself from an awkward, boring or otherwise undesirable situation. I’m sure we’ve all been there – you’re stuck in a business meeting/traffic jam/conversation about why New Kids on The Block should never have made a comeback attempt and there’s no visible way out. How often have you thrown your head back in dismay and thought to yourself – “If only I had an ejector seat!” Too many times, I know. I think it’s well past time for the portable ejector seat. You shouldn’t have to be a fighter pilot to enjoy the option of being able to fling yourself hastily from your current position and shoot off to somewhere new. Very handy for those times when you’d rather be somewhere else but can’t quite make an appropriate getaway. Imagine you’re on a date. Things aren’t going so well and you’d earlier decided that “the rescue call” is a childish idea. You don’t want to leave while your date is in the toilet because you don’t want to be nasty. BAM! Portable Eject! She/He has to give you points for originality there while you fly off somewhere, parachuting safely down in another part of town to either head home or find yourself something more interesting to do. Stuck at a dinner party with friends of friends of friends who bore you to tears with their inane conversations and their incessant one-upmanship? Being allergic to seafood might be an interesting idea, but there’s a risk you will die if you eat those prawns. Not really worth it. WHAMMO! Portable Eject! Saved again by that most awesome of inventions, you can smile and wave as you shoot off into the sunset! That story’s going to be told for generations! You find yourself inexplicably in a cinema and while you’re trying to figure out how you got there, you notice that on-screen a girl’s sighing, some pale guy’s pouting and and some other dude’s wandering around shirtless. Simply running screaming from the cinema won’t cut it. SHAZAM! Portable Eject! You’re now free to enjoy a REAL movie. With a plot and everything. Chances are you’ve freaked out the rest of the patrons with the sudden movement and action, but they all had it coming anyway. 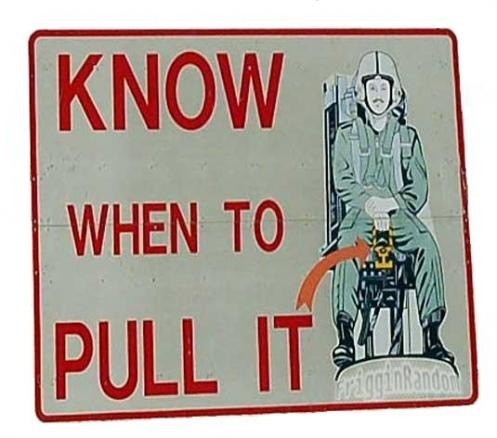 I could go on – I’m sure you could all imagine many situations in which a portable ejector seat would be a Godsend. Why should the pilots have all the fun I ask? From annoying work-related circumstances to uncomfortable social settings, there are countless scenarios in which a portable ejector seat would make everything so much better. Who seriously wouldn’t want the option to extricate themselves in a most devilish fashion from somewhere they don’t want to be?! I don’t know anyone who wouldn’t love it. “SHAZAM!” I loved that TV show! I do agree that a portable ejector seat would be very convenient. However, I would like one that would eject others. That to me is more practical. I am really enjoying your blogs! Slowly I will get to them all. Thanks for writing! Well first of all, thank you for reading! I’m glad you’re enjoying them, I am very aware of the fact that I don’t have the writing talent that a lot of bloggers have. And you are right, I was going to add the fact that the ejector seats could also be useful for people who have a lot of face to face contact with customers/client as well. I’m sure you’re not the only one who would love to be able to eject others sometimes!